While many organizations and companies have their own way of journey mapping, all successful journey maps tend to share several familiar attributes. A successful customer journey map captures the various stages of the customer experience with a company, and the emotional responses the experience generates. It also identifies potential gaps between what customers need, or expect from a business, and what a company provides. Why utilize customer journey maps? Well, there are several major benefits to building customer journey maps. Journey maps serve as a great complement to standard research, as routine corporate data often fails to communicate the frustrations and experiences of customers. Additionally, a customer journey map puts the user front and center in the organization's thinking, which encourages people across the organization to truly consider the user's feelings, questions and needs. 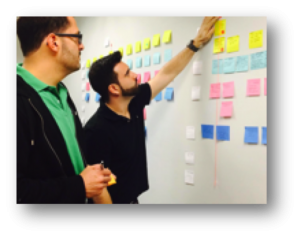 How do you get started with customer journey mapping? This can be a tough question to answer for any organization, as many journey maps, and the process of building them, can seem very complex and quite a lengthy process. However, there are some key foundational rules to follow when getting started with customer journey mapping. Following these rules will put you on the right path to creating great journey maps that help you gain valuable insight about your customers. Recently, we conducted a customer journey mapping workshop in Miami, FL where we outlined some key tips for getting started with customer journey mapping. Below are some examples of the tips we provided during the workshop, and continue to provide to companies to assist them in getting started with customer journey mapping. 1. Mine existing research to have a clear persona/customer target defined before you start building your journey map. 2. Outline the major touch points. 3. Be specific when describing interactions. 4. Limit the number of stages the customer has to go through. 5. Pinpoint what your company wants the user to DO, rather than what the user actually does. Mine existing research to have a clear persona/customer target defined before you start building your journey map. Prior to building your journey map, you should utilize existing research data to pinpoint what target customer or segment you are going to be focusing on in your journey map. Use demographic, ethnographic, and other data from previous research to decide on a target customer you will be focusing on as you build your journey map. Outline the major touch points. Outlining major touch points is the process of defining the major points of interaction a customer has with a business and the service(s) that business is offering. For example, if a coffee shop was defining the major touch points its customers go through when buying a cup of coffee; customer decides to go get a cup of coffee, customer drives to the coffee shop, customer waits in line at the coffee shop, customer places their order at the register, customer pays for their coffee with a credit card, etc. By outlining the major touch points a customer goes through, companies can gain insight into not only those touch points, but also the transitions the customer goes through between touch points. Defining the transitions between touch points can help businesses to see where customers may be dealing with certain issues or frustrations, at which point an organization can develop ways to remedy those issues to improve the customer experience. Be specific when describing interactions. Specificity when describing customer interactions is crucial, as it helps to view the customer journey in its entirety, making it easier to distinguish between major and minor touch points. This gives businesses the ability to see if it is falling short at a critical touch point in the customer's journey, thus opening up a grand opportunity to improve that point in the process and improve the overall customer experience. Limit the number of stages the customer has to go through. Customer journey mapping provides businesses with a holistic view of the customer journey, which allows businesses to see if there are steps throughout the journey that could be refined or even eliminated entirely in order to improve the customer experience. Pinpoint what your company wants the user to DO, rather than what the user actually does. When customers go through the process of purchasing something, the major touch points they often go through are stages such as Inquiry, Comparison, Purchase, Installation, and Post-Purchase Evaluation. Over time the customer journey can change and/or become altered as a result of many different factors. However, customer journey mapping allows businesses to identify these changes and monitor them to make sure they are not impacting the customer experience in a negative way. Businesses have the ability to take appropriate actions when needed to make sure customers are not going through unnecessary steps throughout the experience. This allows businesses to shape the experience and customize it for their customers, ensuring their customer's experiences are as seamless as possible. Honing in on the aforementioned tips and the key foundational aspects of customer journey mapping will put your organization on the right path to understanding your customers and their experiences more intimately. Utilizing customer journey maps will help your organization to better understand the key actions and motivators of your customers as they interact with your business and its products and services. Equipped with this knowledge, you’ll be able to identify your strengths and weaknesses, and subsequently reveal the primary areas where opportunities for growth and prosperity exist. For more on Customer Journey Mapping, download our white paper.